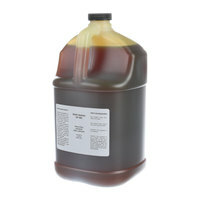 Multi-purpose oil is a versatile solution to have on hand in your establishment. Since it can be used on a variety of equipment types, including mixers, transport carts, and convection ovens, you won't have to purchase multiple products to fix your various appliances. Plus, since a 3-in-one oil can fix multiple issues, you'll get more out of your purchase. Also make sure to check out other great items from Noble Chemical, 3-IN-ONE, Antunes, Carpigiani, Crystal Sheen, Hobart and Stephan. By staying stocked up on chemicals for your equipment, you’ll be able to quickly fix a squeaky or stuck mechanical component. Plus, it’s important to use these chemicals to perform regular maintenance on your equipment, so you can prevent its parts from becoming worn or broken. Also, by purchasing your chemicals and lubricants in bulk supply, you’ll have plenty to last throughout the year, and you won’t have to reorder as often. For other great products to have in stock in your commercial kitchen, check out our heavy-duty gloves, sanitizing wipes, and dish cloths. If you're wondering where to buy hobart mechanical chemicals and lubricants, we have a large selection of hobart mechanical chemicals and lubricants for sale at the lowest prices.